How can I notify coworker users when adding contacts, tasks, events, projects, or opportunities? 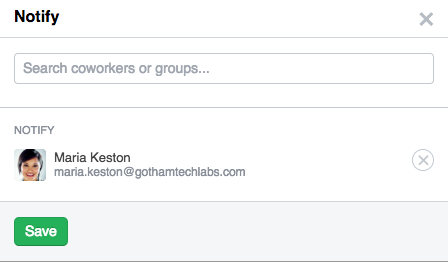 Notifying is a useful way to keep coworkers in the loop of important CRM data entry, via email. Users in your Wealthbox account can be notified by email when something is added by choosing the “Notify” field in the lower left corner of the activity's publisher. To notify someone within your workspace of a new entry, start typing the first letters of their name to get the auto-fill options. Choose a coworker name from the roll-down list. When you add the CRM data (eg. a new contact name or task) the person(s) you selected for notifications will receive an email notifying them of the new CRM data input and any notes you’ve written along with a link back to Wealthbox and the specific CRM data entry.